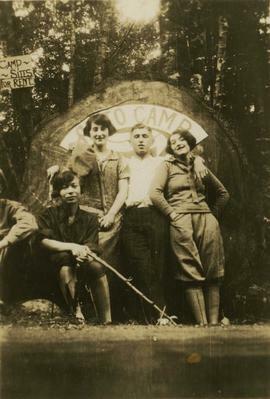 Photograph of Rachel Seidelman and Ruth Mahrer, who is probably Rachel's friend. Photograph of Rachel Seidelman standing in the back yard of her home at 1735 East 2nd Avenue, Vancouver, British Columbia. Photograph of Harry Seidelman with a group of unidentified people rowing a boat. On the photograph it seems that the word "RAINBOW" is written on top of the boat's image. Amusement guide booklet for the week of February 18th (Monday), in Sydney, Australia. The guide lists plays and attractions.